Philip Kotler is the “father of modern marketing.” He is the S.C. Johnson & Son Distinguished Professor of International Marketing at the Kellogg School of Management at Northwestern University. He was voted the first Leader in Marketing Thought by the American Marketing Association and named The Founder of Modern Marketing Management in the Handbook of Management Thinking. Professor Kotler holds major awards including the American Marketing Association’s (AMA) Distinguished Marketing Educator Award and Distinguished Educator Award from The Academy of Marketing Science. The Sales and Marketing Executives International (SMEI) named him Marketer of the Year and the American Marketing Association described him as “the most influential marketer of all time.” He is in the Thinkers50 Hall of Fame, and is featured as a “guru” in the Economist. He has received 22 honorary degrees from around the world, and published over 70 books. In 2010, Professor Kotler created The World Marketing Summit (WMS), an independent global organization, committed to creating a better world for our future generations through marketing. His latest work is on brand activism, democracy and the common good, and the problems of capitalism. Let’s start by asking – what does leadership have to do with the common good? The common good has to do with what is shared and beneficial for all. Aristotle defined it as “common interest,” Thomas Aquinas as “the common good” and in the US, one of our founding fathers, James Madison, tied it to justice, which he viewed as the purpose of government and civil society. In France, Jean-Jacques Rousseau called it le bien commun. In India, there’s a Gandhian ideal called sarvodaya, sarva (all) and udaya (uplift); the good of the individual is contained in the good of all, and vice-versa. It’s really about the highest ideals of a democracy – that we are all one, united people – with liberty, equality and justice for all. Now, where have we heard that before? So a leader, by definition, is going to be someone who answers the call to nurture the common good. Their lives are lives of service to a higher calling – the public good. In business, we see this sort of leadership amongst the best companies – companies that go well beyond the bottom line – to embrace progressive brand activism, to actually improve the condition of the world. The same can be said for political leadership – leaders who are serving the public, not simply themselves or their friends in high places. What are the key leadership considerations for the CEO? Trustworthy leaders listen to their employees and key stakeholders. I would go further and say that leaders listen to the voice of the planet – the voices of those who are voiceless. Apple CEO Tim Cook has said that as government fails to deliver, business and other areas of society need “to step up.” All businesses benefit from a well-working economy with good infrastructure and well-trained and motivated workers. The leader of a nation is also the brand guardian of the nation. How they behave reflects on the entire country. Today we have a real challenge for political leaders – they must work to correct the imbalances caused by capitalism as it has been practiced globally. As we speak, the French Prime Minister, Emmanuel Macron has his hands full with the yellow-jacket revolution. Why is this happening now? What must leaders do to solve the problems facing so many of their citizens? 14. Needs to bring social values, well-being, and happiness into the market equation. Political leaders must pay attention to these very serious issues. These issues make up the common good. Without addressing these issues, politicians will not last long in office – certainly not in a democracy. So who exemplifies this sort of leadership today, in politics and in business? As you know, I have been very critical of the President of the United States. We are facing a crisis in our democracy. Across the world, we see a handful of leaders that have brought their countries to the global stage and provide real leadership. believes in representative government and in social justice. believes that a good society will build a healthy business climate. encourages businesses to practice the triple bottom line, namely to balance profits, people, and the planet in their deliberations. sincerely and wholeheartedly works for the Common Good. On these criteria, Prime Minister Modi stood the highest. He has improved his country’s image and visibility on the global stage. A committee in the WMS voted on possible leaders given the above criteria. The final decision was mine. I heard there has been some controversy about the award – what’s that about? You know India has a robust democracy. 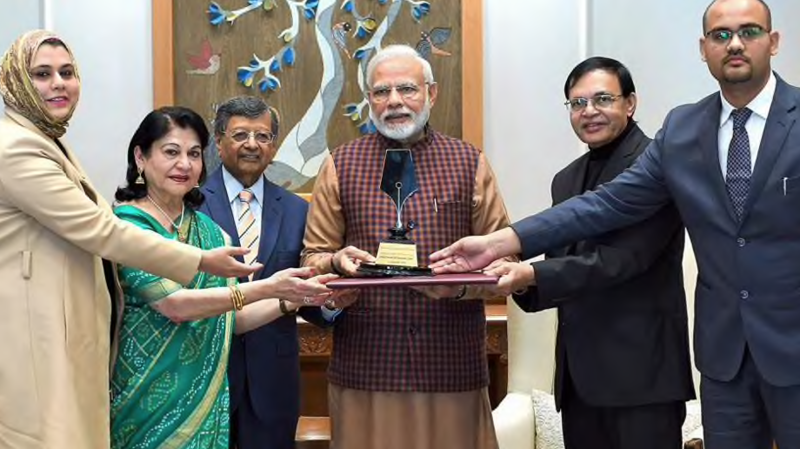 The opposition to the Prime Minister started criticizing the award – which is regrettable – since the award honors India, inasmuch as it honors the PM Modi. Unfortunately, I was not able to make the trip to India. My physician advised that I should not travel all the way to India, not just now. So I asked my lifelong friend, the distinguished Marketing Professor Jagdish Sheth, to do the honors in my place. We are working on the Philip Kotler Business Leadership Award. I’ll let you know when we have our winner.